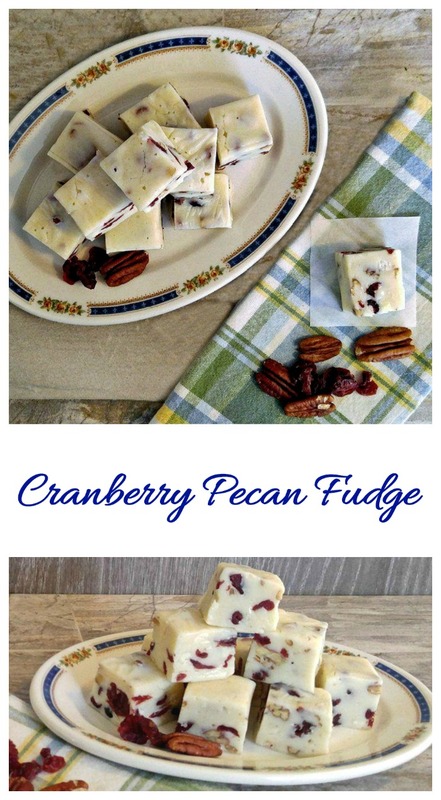 This easy to make cranberry pecan fudge recipe has loads of fall favor & a just a hint of sea salt. It’s perfect for holiday entertaining and gift-giving. The taste is sweet, tart and crunchy, all in one delicious bite! 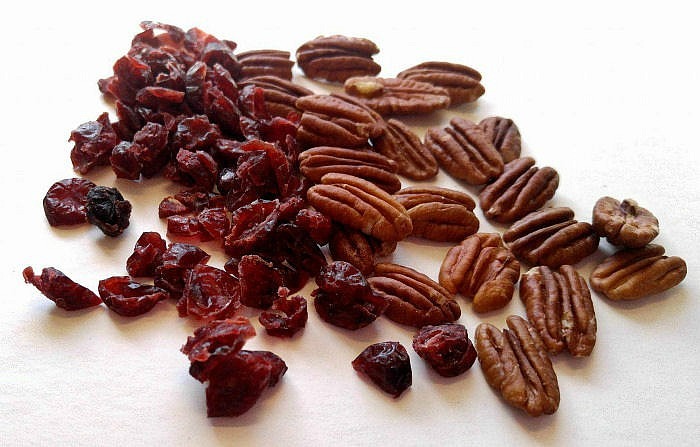 Cranberries and pecans are two of my favorite fall flavors. I use them in sweet treats such as this delicious pecan fudge and also in savory recipes like these cranberry pecan crostini appetizers. I love making fudge for the holidays. Each year I try some new combinations. Be sure to check out my pistachio fudge and buckeye fudge. Both are real crowd pleasers. I’ve also written a post with tips for making the perfect fudge every time. Follow them and your fudge recipes will be fool proof! 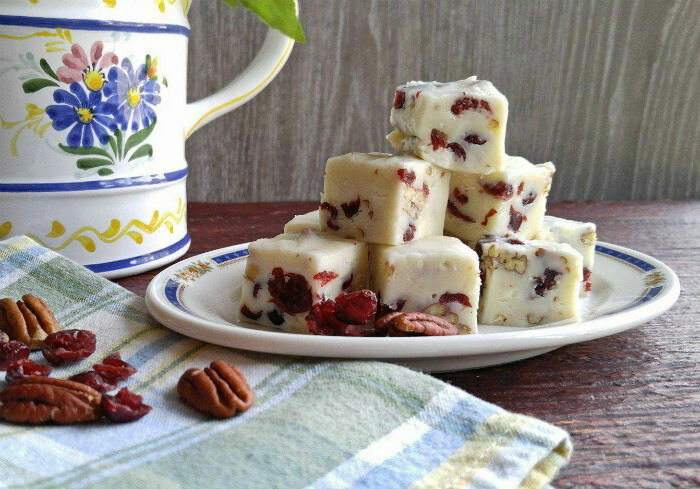 Making this cranberry pecan fudge is quick and easy. This post contains affiliate links for your cooking experience. I earn a small commission but there is no extra charge to you. The recipe has just 6 ingredients and is ready to chill in less than 10 minutes! 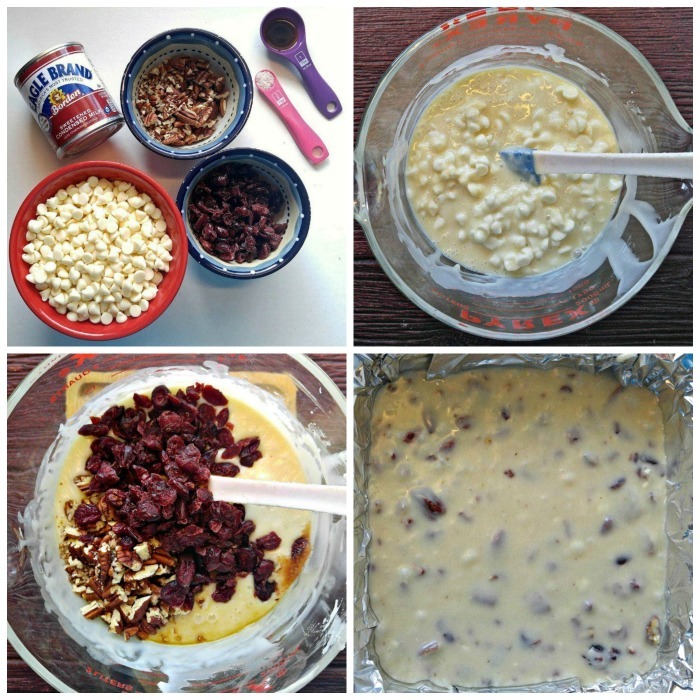 To make it, you will need dried cranberries, pecans, white chocolate chips, sea salt, vanilla and sweetened condensed milk. I love the colors of the fudge when it is done! It has sort of a mosaic thing going on. I used a large Pyrex measuring bowl with a spout. It is microwave safe and makes the pouring stage a cinch. When I say this pecan fudge is easy, I really do mean easy. All the cooking is done in the microwave. 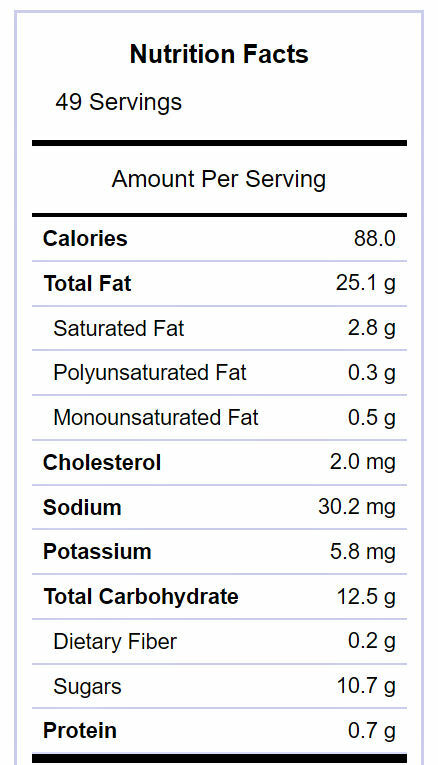 No candy thermometers or soft ball stage and very little stirring. It’s the perfect fudge for a beginning cook who wants to try their hand at fudge making. All you need to do is heat the white chocolate with the sweetened condensed milk in the microwave on 50% power until it is smooth and then stir in the rest of the ingredients. I cooked mine about 5 minutes until the white chocolate was starting to firm up on the edges of the bowl and spatula. Lining my pan with aluminum foil makes removing it after setting very easy. 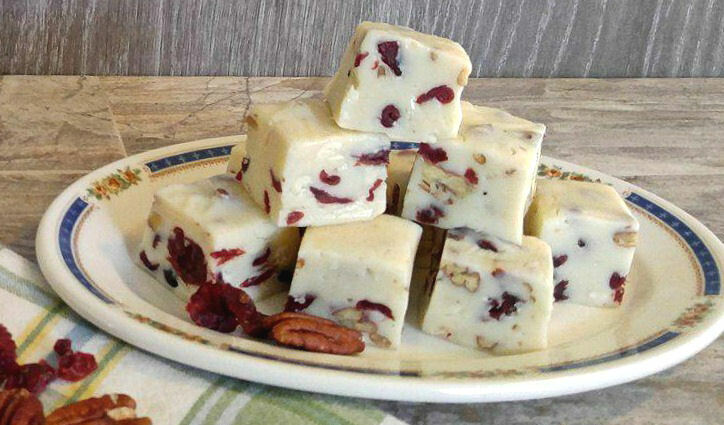 Ready to taste this cranberry pecan fudge? This fudge is decadent. It has a creamy firm texture with a lovely tartness that offsets the sweetness a bit and a nice crunch from the chopped pecans. A hint of sea salt finishes off the taste nicely. It’s the perfect holiday bite! This fudge cuts more easily if you freeze it while it’s setting. You can get nice clean knife edges if you freeze it first. Line an 8 x 8 inch pan with aluminum foil and spray with a cooking spray. Set aside. Place the white chocolate chips and sweetened condensed milk in a microwaveable bowl. Heat on medium in one minute increments until the white chocolate has melted, about 4-5 minutes. Stir the mixture after each minute. You will know that it has cooked enough when the white chocolate is completely smooth and it is starting to firm up on the bowl and spatula edges. Quickly stir in the sea salt. vanilla extract, cranberries and pecans. Mix well. Pour into the prepared pan, and place in the freezer for about 2 hours or until it is completely firm. (it cuts better when frozen.) Cut into 1 inch squares. Enjoy!